Earth-i has been awarded a grant of £2.7 million from the UK Space Agency’s International Partnership Program, which supports UK space firms tackling global challenges. The grant will enable Earth-i to launch the ACCORD program in Kenya and Rwanda. ACCORD has been specifically developed to help smallholder coffee farmers in Africa improve crop quality and yield. It combines Earth-i’s very high-resolution satellite imagery with WeatherSafe’s data platform to provide extensive crop, weather and pest analysis — and shares the information via a mobile app. 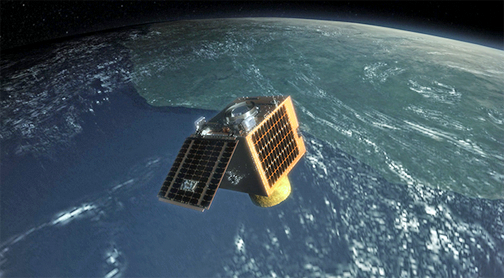 Artistic rendition by Earth-i of the firm's VividX-2 satellite. ACCORD will enable farmers to identify where more water, fertilizer or pesticides are needed to address unpredictable weather, pests, diseases, nutrient depletion or other factors which reduce coffee quality and quantity. ACCORD evolved from work carried out by Earth-i and Weathersafe in Burundi. Together the two companies performed surveys of Burundi coffee farms using very high-resolution satellite data, conducted crop yield analysis and developed bespoke web applications to deliver the results of this analysis. The ACCORD project was one of only ten programs to receive funding as part of a joint initiative between the Government’s Industrial Strategy and the UK Space Agency’s International Partnership Program, which uses UK space expertise to deliver innovative solutions to real world problems across the globe. Footage will be available for analysis within minutes of being captured and will improve decision-making and response times in a wide variety of scenarios from change detection to object identification, from disaster response to infrastructure monitoring. Science Minister Sam Gyimah added that the UK Space Agency’s International Partnership Program will help developing countries tackle big issues such as disaster relief and disease control, while showcasing the services and technology on offer from our leading space businesses.